If you wish to purchase any of these books, click on either the title or the book cover to be directed to Amazon.com. As a warning, I have put up pictures of the book covers to give you somewhat an idea of the style of each book (I know, I know. "Don't judge a book by its cover") so the pages may load slowly, depending on the speed of your internet connection. Sammy Spider returns for another adventure with the Shapiro family. Sammy watches the Shapiros plant a sapling on Tu B'Shevat. He wants to plant a tree too, but his mother tells him "Spiders don't plant trees. Spiders spin webs." As his mother weaves a blanket, Sammy watches flowers appear, then leaves appear, then leaves changing color, and then the leaves falling out leaving a bare tree. When winter comes again, the Shapiros plant a new sapling, which Sammy decides to keep warm with a new web "blanket" he weaves. Like all the books in the Sammy Spider series, Sammy Spider's First Tu B'Shevat teaches a concept in addition to the Jewish holiday. In this case, the seasons are emphasized. As the tree (and its occupants) change throughout the year, Sammy also watches the Shapiros play outdoors in the different seasons. Children will delight in the continuing saga of their friend Sammy Spider! By Edie Stoltz Zolkower As a boy and his family plant a sapling, they imagine all the wonderful things the tree will provide: shade, fruit, breezes, a home for birds, and even a place for the boy to hang a tire swing. Together, they celebrate Tu B’Shevat, the birthday of the trees. This ode to the trees features a family planting trees for Tu B'Shevat and enjoying the "fruits" of their labor. They enjoy the shade, the fruits the tree provides, the clean air, a home for the birds, and a place for the family to relax every year. Finally, on the next Tu B'Shevat, the boy and his family pick a new spot and plant a new sapling to start the cycle anew. The warm illustrations and lyrical rhymes will be sure to engage young readers. An excellent choice for teaching about the importance of trees to toddlers and preschoolers. By Marji E. Gold-Vukson, Like the tiny seed a little boy and his grandpa plant, this rhyming tale grows and blossoms into a celebration of nature and of family. Included are “Ten Great Ways” to enhance your Tu B’Shevat celebration. 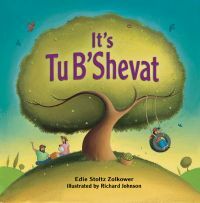 This heartwarming picture book shows the love between a grandparent and grandchild in celebrating Tu B'Shevat. 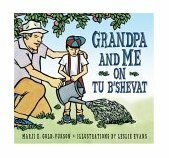 A child and his grandfather use a shiny, new shovel to plant a seed one year on Tu B'Shevat. As the tree matures, so does the child, who eventually uses the shovel (now rusty and worn) to plant a new seed with a grandchild of his own. Gold-Vukson uses a rhyming cumulating verse scheme reminiscent of The House That Jack Built that will surely keep children engaged throughout the story. Includes a brief description of the customs of Tu B'Shevat and "Ten Great Ways to Celebrate Tu B'Shevat". A perfect choice for reading aloud together as a family. By Matt Biers-Ariel Amid the tranquillity of sun-dappled forests in ancient Israel, Solomon the future king, is said to have gained his renowned wisdom. Each spring, Solomon approached the grandest tree in the forest and listened for the sound of the sap, the flowing life force heralding the renewal of the forest. But Solomon's duties as a sovereign, particularly the demands of building the Temple to honor God, left him no time to visit his beloved wood. When the Temple is completed, Solomon sets out for the forest. As he approaches, he senses a strange silence: there are no chirping birds or shuffling animals. There are no trees: they have been felled to build the magnificent Temple. Determined to restore what he unwittingly decimated, the grieving king collects seeds from the forest floor, nurtures them, and plants new trees at the full moon of the Hebrew month of Sh'vat. Legend has it that this was how the Jewish holiday of Tu Bish'vat came to be. Books on this celebration are rare, and this one meaningfully extends ancient traditions to encompass current concerns about environment. Solomon was a young prince who lived next to a large forest where he spent every spare moment because he preferred peaceful trees to rancorous humans, and was taught to speak their language by the animals who lived there. When Solomon grew up and became the king, he found himself so busy that he forgot about the forests and his animal friends. Eventually Solomon came to understand the price that must be paid when people don't take proper care of the earth and its blessings. Highly recommended for young readers grades 1-3, and based on a Midrash folktale and Judaic teachings about the earth and the festival cycle, Solomon And The Trees is an outstanding and superbly presented collaboration between author Matt Biers-Airel and illustrator Esti Silverberg-Kiss. A long time ago, in the Land of Israel, a young prince named Solomon lived next to a large forest. Solomon spent every spare moment in the forest because he preferred the company of the peaceful trees to his busy city life. Solomon made friends with the animals living there and learned to speak their language. They taught him secrets no human had ever learned, like how spiders keep from getting caught by their own webs and the reason bats sleep upside down. Solomon loved the forest, and the forest loved him. But all too soon Solomon grows up and becomes a king. He becomes very busy and forgets about the forest and his friends the animals. In this lushly illustrated environmental midrash, Solomon comes to understand the price that must be paid when we don’t take care of the earth and its blessings. A Seder for Tu B'Shevat This Tu B'Shevat celebration traces the history of the New Year for Trees and highlights the importance of conservation and ecology today. Stories, readings, blessings, fruit-tasting, and seed-planting. Four questions, four cups of wine, and music to favorite songs. y Yaffa Ganz Minor holidays? What’s minor about days that are so enjoyable and have so much to teach? When Bina and Benny -- and their favorite talking holiday dove -- get to work, every special day in the calendar is interesting and exciting. So let’s hurry inside the covers of this book and see where they take us. They’ll show us Lag Ba’Omer and Tu Bishvat as we never knew them before. One thing is for sure: Lag Ba’Omer and Tu Bishvat will be more wonderful than ever. By Neil Waldman When his family comes to live in Israel after the end of World War II, a young boy begins planting and caring for trees, a practice that spreads across the whole country. An old man recalls his childhood in the tree-lined city of Vilna, where his family escapes from the ghetto and is protected by the forests surrounding the town. Later, following immigration to Israel, the boy helps plant trees in his new desert homeland so that the country can once again become a sea of never-ending greenness. Although the story focuses on the efforts of one family, its actions reflect a national effort to reforest Israel and correlate with contemporary celebrations of Tu b'Shvat, the Jewish New Year of the Trees. Waldman's colorful acrylic paintings, rendered in an impressionistic style, are best viewed from a story-hour distance. Liberal use of greens, blues, and pinks creates a hopeful atmosphere, in keeping with the tone of the story. A perfect choice for Tu b'Shvat story hours, this will also be useful for primary ecology units. The Little Leaf Who would think about the life of a leaf and the stages it goes through from bud to old brown leaf? One might see this as a lovely story for the holiday of Tu b'shvat or perhaps a starting point to talk about life cycle events. However one decides to use this to read to children 3 to 7, it is a beautiful story with bright, colorful, upbeat illustrations. Regardless of one's age, there will be a story in this book. When people are becoming more and more ecology conscious, something we Jews have known all along, this book will be a beautiful story to read to or with children. The Little Leaf is a picture book for young readers with a Tu B'Shvat theme: It's the cheerful story of a leaf, from its first spring appearance as a bud to its decay and uplift by the wind. A recurring refrain throughout the lifecycle is "Everything that Hashem does is really for the best." Teacher's Edition Also Available Listen To The Trees looks to the Torah for its environmental wisdom. Through quotations, sayings and stories, Molly Cone gives young readers an inspiring view of the Jewish connection to the natural world. Listen To The Trees presents Torah teachings that have made responsibility for caring for the earth an important part of Judaism from its very beginning. Roy Doty's charming illustrations enhance the value of Listen To The Trees as an informative and engaging book of interest to any young reader with a concern for nature and our environment. By Sue Alexander Tracing the horticultural history of the land now known as Israel, Alexander (One More Time, Mama) delicately but powerfully implies a parallel between its trees of and the Jews who settled there. Beginning in 5000 BCE, she fleshes out a timeline that blends history and ecology to chronicle the cycle of bloom, destruction and renewal that has characterized this land over the centuries. She tells of "centuries of wandering the time of Abraham, Isaac and Jacob," of farming and settlement, of occupations and wars, from the Babylonians and Romans to the Turks and the British. The land stands stripped of its timber until "no owls or doves remained to soar through the air or trill their songs." Rejuvenation begins after WW I, as Jews the world over save to fund the purchase of new trees, trees that have restored present-day Israel to its former beauty. Alexander's poetic imagery ("fires sent twists of smoke into the air") and elegiac refrains ("And no new trees were planted") are heightened by Gore's (Sleeping Boy) resonant, haunting pairing of shepherds and prophets, soldiers and settlers with the graceful flow and sweep of branches and leaves. He plants Corinthian columns of a conquering nation side by side with tree trunks, one of many visual metaphors that hint at the interconnectedness of life. Profoundly satisfying. A combination of lush illustrations and melodious prose tell the story of a land called Canaan, which bloomed with wild trees. During the time of the Israelite kings, cities and towns were built but "no new trees were planted." Then six hundred years of war followed. Fortresses were built out of the trees. Forests were set on fire so that enemy troops would have nowhere to hide. Much later, the Turks ruled the land and used trees to build roads and bridges. The remaining trees were destroyed by black goats who chewed up the roots. Without the protection of trees, the land became a desert. Animals and birds disappeared. Then a little more than fifty years ago, people came back to the land and made the desert bloom by planting millions of trees. This splendid book celebrates an environmental miracle that people of all faiths can admire. Leonid Gore's illustrations are stunning. The trees are drawn with human features. Branches sprout from hands tattooed with concentration camp numbers. Tree trunks reveal a mother cuddling a baby and a scholar holding a scroll. Readers will be mesmerized by these pictures within pictures, dramatizing an impressive story of destruction and renewal. By Phillis Gershator Honi, a character from Talmudic legend, is known for three things: the planting of carob trees across ancient Israel, his ability to communicate with G-d from within an iconographic circle, and for his selflessness-he plants not for himself, but for the generations to come. In its previous incarnation, Honi and His Magic Circle, three separate episodes in the wanderer's life were related. This version has a cohesive story line and animated folk-style illustrations. Honi wanders the land planting his seeds, comes to a village where a man remembers his rain miracle from years before and leads the old man to take a rest. When Honi awakens from what he thought was his nap, he learns that 70 years have passed; confused and upset at first, he realizes that he has been allowed to see his trees bear fruit. This is a lovely book not only for the Jewish holiday of Sukkot or Tu B'Shevat, but for any library that wants a book on ecology or selflessness. An appealing retelling. By Barry L. Schwartz This charming book tells the story of a man who travels throughout the land of Israel planting carob seeds wherever he goes. Ancient Israel is no Garden of Eden, as the people of Honi's town discover when they are plagued alternately by drought and flood. But Honi teaches them how to live in right relationship with the creation and the Creator. Complemented by beautiful illustrations, these tales will encourage children and adults alike to appreciate the connection between their faith and their desire for a healthy, bountiful earth. By Peter J. Dyck Safe and happy in the forest, the animals and birds try to find a way to stop the farmer from cutting down trees and destroying their home. This book along with the sequel, Shalom At Last are two of the most wonderful animal/environment books I have read. As touching as "Charlotte's Web" the reader ends up truly caring about the animals. The authors love for G-ds magnificent creation and creatures is evident yet the story does not have any "religious" wording that would make it unreadable in my public school classroom. My second grade students especially loved the picture of Mr. Dyck at the end of the book in front of the recycled materials playhouse he and his grandchildren built. By Peter J. Dyck In this sequel to The Great Shalom, the forest animals make a real peace with Mr. Farmer, and he turns his forest into an environmental education center.